My husband and I have been going over a lot of our financial goals, and hopes and dreams lately. We have really been thinking about what kinds of things we value and want to put time and money in to. One of those things is travel! We travel semi-frequently, but we almost always go to the same places because we have out of state family. Which is fun! Lately, as we've been thinking more and more about some of these dreams and goals for the future, travel has been coming up more and more. We talk often about how we want our kids to have those experiences, and how we would so much rather invest in giving them something with lasting memories, life experiences, and time together, than fleeting things that they won't care about in a month. Traveling is so beneficial in so many ways and we really enjoy it (and our kids really seem to, also...so far!) . Though I have traveled quite a bit in my life, and been to a few other countries as well, there is so much of our country I haven't seen! I've never been anywhere on the East side of the country (do you count Florida as East, or South? Because I've been there, but I think of it more as South I guess). There are so many other places we've never been to and that we really don't know a whole lot about. 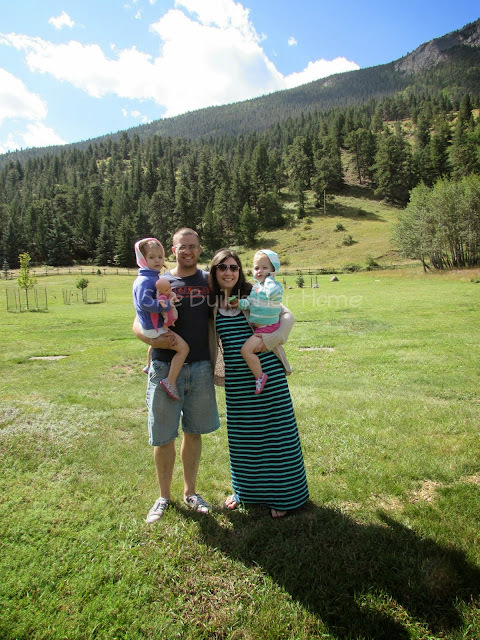 So we decided to try to take our kids to every state by the time they leave our nest! That gives us about 13 years before our oldest graduates from high school. Some places we will probably visit more than once (like Colorado and Texas, where we have family and go every year or two), and some places we might only visit for a couple hours. But we want to see it all! We decided that to make it "count" as a visit to that state we have to DO something there. We can't just pass through on our way to another state and never stop. We have to, at the very least, stop and eat a meal there, or see some kind of sight or do an activity. Some states we will vacation to for an entire week or more. Some places we may only stop at for lunch and to get a post card. I would really like to at least spend one night in all of the states, but I know it might not be do-able with some. We plan to do a big East Coast trip when our kids are tween-teen age and can appreciate a lot more of the landmarks and historical sites. I'm guessing we will probably hit 10-12 states on that one trip. Since we live in the middle of the country, we have so many states within just a few hours from us. We'll have to hit about 4 states per year on average, to make it work. But like I said, since some years we will probably tour around whole regions, we will also probably have years where we only do one or two states close by. 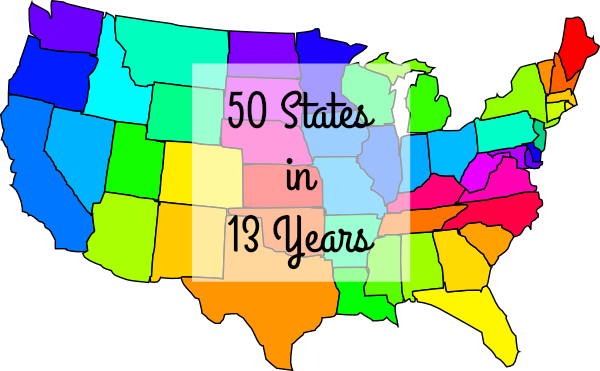 I am not yet sure if we will realistically be able to do Hawaii and Alaska, so we haven't decided for sure if we are going to make this the 48 contiguous United States, or all 50. I would love to do like a big Alaskan cruise or Hawaii vacation to end the whole thing with a bang, or something. We will see! We would also like to mix up how we travel and stay a lot of the time. Some times we may rent an RV and hit a bunch of states. Other times we may get a cabin in the mountains for a week. Maybe we will do a few weekend camping trips in other states close by. We are also starting our count from 2016. So even though we have been to a lot of states before, our kids haven't been to a lot of them, or don't remember seeing them. If you have any awesome places or landmarks that we should be sure to hit over the next 13 years, let me know! I am excited to see a lot of the places I have heard about and learned about! And so excited to give my kids these experiences, learning opportunities, and to get more opportunities to focus on time together as a family. Now I need to figure out a way to document/display the states we've visited as we mark them off! I thought this map was kind of neat. You can put a photo in each state which would be a fun way to document what we saw/did in each state and also be able to display in our home. If you have any other cool/unique ideas of how to document where we go, let me know! Do you have any travel goals? How many states have you visited?